Muslim Stamp by U.S. Postal Service Commemorates Muslim Holidays-Truth! & Fiction! - Truth or Fiction? Muslim Stamp by U.S. 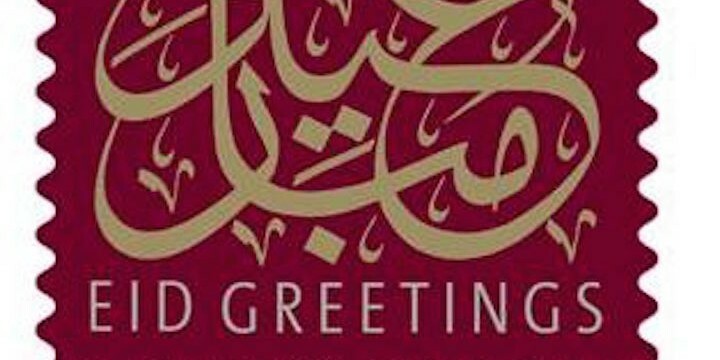 Postal Service Commemorates Muslim Holidays-Truth! & Fiction! Various emails that say a Muslim stamp has been released by the U.S. Postal Service to commemorate a Muslim holiday. Some version list a number of terrorist events believed to have been carried out by Moslems and call out for a boycott of these postage stamps. There are U.S. Postal Service (USPS) stamps commemorating the EID season during the Muslim period of fasting and prayer known as Ramadan. There are also customized stamps from other vendors that contain a USPS barcode for mail. This eRumor has a habit of going viral every time the U.S. Postal Service raise the price of a first class stamp or during the Ramadan season. In late January 2010 rumors began to circulate that the U.S. 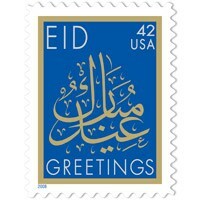 Postal Service released a new version of a postage stamp commemorating the EID Muslim Holiday. In 2011 the USPS issued a new version of the stamp, which sparked another fury of emails to circulate the Internet. Each of the terrorist events has either been connected to or believed to be connected to Muslim terrorists, but the most common question we get is whether the postage stamp story is true. According to the United States Post Office website the stamp has had several issues in various denominations spanning from 34 cents in 2001 to 41 cents in 2007. The latest release was announced August 12, 2011 with a “Forever” denomination, which means that its value will remain constant with any increases in first class postage. The postage stamp illustrated below was not issued by the USPS but by the Zazzle.com web site that sells custom made products, including postage stamps. The web site has a variety of EID stamps and also permits customers to upload personal photographs for custom apparel, mugs, postage stamps and gifts. According to the U.S. Postal Service, a 34-cent stamp was issued in September of 2001 and October of 2002 commemorating two important Islamic celebrations or eids. They are Eid al-Fitr and Eid al-Adha. On those days, Muslims greet one another with “Eid mubarak,” which translates literally as “blessed festival.” The phrase is written in Islamic calligraphy on the stamp. 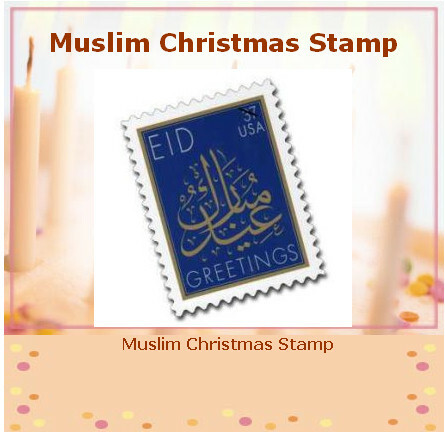 A later version of the eRumor circulated saying it was a “Muslim Christmas Stamp.” That is a fabrication someone added along the way. Although Muslims regard Jesus as a prophet, they reject Christian belief that Jesus is the Son of God and God incarnate and do not celebrate Christmas. The Islamic celebrations the postage stamp commemorates are roughly in November and January and are celebrations that many Muslims focus on during the Christian holidays. REMEMBER the MUSLIM bombing of the USS COLE. REMEMBER the MUSLIM attack on the World Trade Center on 9/11/01. attacks. 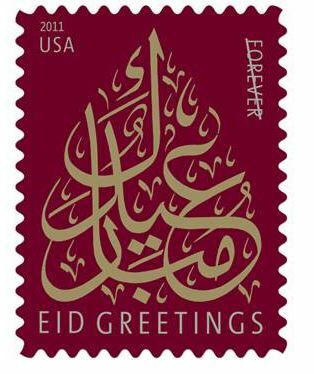 Now the United States Postal Service REMEMBERS and HONORS the EID MUSLIM holiday season with a commemorative first class holiday postage stamp. of those whom this stamp honors. I also strongly urge you to pass this along to every Patriotic AMERICAN you know, whether by email. 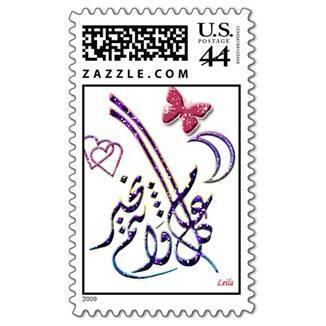 USPS New 44-Cent Stamp Celebrates a Muslim holiday! If there is only ONE thing you forward today… let it be this! 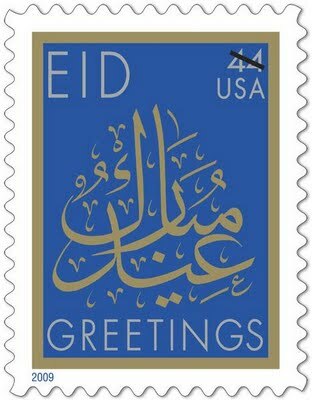 President Obama has directed the United States Postal Service, to REMEMBER and HONOR the EID MUSLIM holiday season with a new commemorative 44-Cent First Class Holiday Postage Stamp. REMEMBER to adamantly & vocally BOYCOTT this stamp when you are purchasing your stamps at the post office. Wake-up guy’s they are doing it again !! The ball of yarn keeps getting bigger…………. New Stamp – the second one!!! USPS New 44-Cent StampCelebrates a Muslim holiday. Tell whom ever, to stick this stamp in where the sun does not shine, I know that I will. Cancer can be caused by foods in plastics and that's how Sheryl Crow gotcancer-Fiction! and Unproven! The twist ties on loaves of bread tell how fresh they are-Truth!